Renovated recently and in keeping with local architecture and traditional craftsmanship, the hotel ‘Byzantino’ and its guest houses, are composed of several lovingly and impeccably restored stone buildings which house 21 traditional styled rooms of varying sizes. Most rooms have sea views whilst, others overlook the castle township. Several have private balconies that allow guests to enjoy the spectacular sea views of the ‘Mirtoo’ gulf; while others offer fireplaces, for cozy winter nights. Each room has its own distinct character, embellished with local stone craftsmanship and antique furniture. 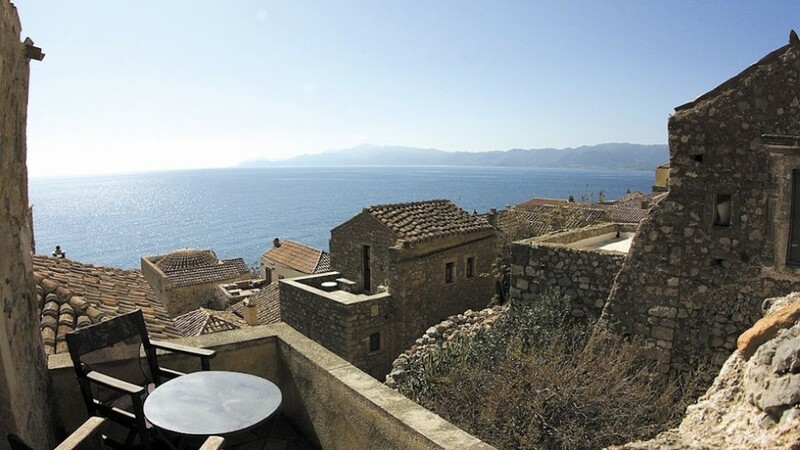 Less expensive rooms do not have sea views or balconies, but are just as charming and oozing with byzantine castle atmosphere. All rooms are equipped with a mini fridge, air-co / heating and hair dryers, not all but most, also have satellite TV. The reception hall is equipped with WI-FI connection for internet users. The hotel offers its guests a relaxing break at both the cafeteria ‘Byzantino’ situated on the central square and the renown Enetiko Café & Bar with its spectacular terrace overlooking the gulf; here one can enjoy a cool long drink to the sound of music under a star lit sky; pure magic!